I would need more than two hands to count the psych meds I’ve been given. There are enough that I don’t remember all of them; it started in the first grade. Some were just regular ADHD meds—which I needed—not psychotropic. As years passed, others were anti-anxiety SSRIs, and then antipsychotics; many well before I’d hit the end of middle school (these include Risperdal, Paxil, and Wellbutrin). 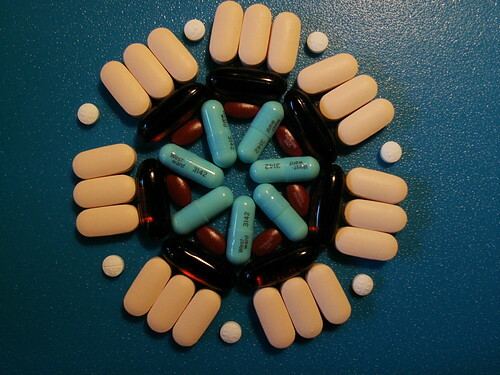 But the medications were like a merry-go-round. Some effectively sedated me, others made me uncontrollably irritable. Abilify is proving difficult to get off of, even though I'm experiencing the side effect moderate akathisia, which is “a movement disorder characterized by subjective feelings of internal restlessness or jitteriness with a compelling urge to move. Patients describe ‘nervousness, inner tension, discomfort, restlessness, itching, and/or an inability to relax.’” The result is repetitive, unwanted movements that primarily affect the legs. Untreated, akathisia can lead to worsening suicidal ideation, agitation, and aggression. I found out I wasn’t alone in the overmedication department in the 2010s, when I found autistic community, and read some anecdotal experiences. For this article, I collected information about autistic people's experiences with medications in an informal Google Forms survey. One survey respondent, Alex, has been on 11-15 different psychiatric medications between the ages of 4-18. Cat says they’ve been on 16 or more so far. Survey taker “12-year-old boy” states he was around four years old when he was first given meds. And S.L. and Cass report they were around eight years old when they started meds. Multiple survey respondents noted they had been on four or more medications at one time. I discovered scientific research on the heavy medication of autistic people in 2016, while I was looking into how autistics interact with the mental health care system. In 2008, The Interactive Autism Network (IAN) published a breakdown of psychiatric medication types used as autism "treatments": Of the more than 5,000 parents surveyed, 31% reported that their autistic children were taking at least one psychotropic drug, and 6% were taking three or more. And in a 2014 study on prescribing in primary health care, researchers note “Drug surveys and studies of health insurance claims databases conducted in the USA have shown that over time more psychotropic drugs (and in particular antipsychotics, antidepressants and stimulants) are being prescribed to children, young people and adults with ASD…” and there is “limited evidence to guide psychotropic medication use in the ASD population.” A 2013 article concurs about the lack of evidence. The research cited above shows that medical professionals should be judicious in prescribing medications. Yet the authors of the 2014 primary health care study condone the use of aripiprazole (Abilify) and risperidone (Risperdal), which are both antipsychotics. The article states that these drugs have demonstrated efficacy in treating irritability, aggression, and self-injurious behaviors in autistic people. My personal experience is that I was prescribed Abilify at age 16, presumably as an adjunct for my SSRI (an antidepressant drug type), and when I then developed akathisia, I was simply prescribed added muscle relaxants. As Risperdal caused me uncontrollable anger and irritability, I was taken off of it. These two drugs are FDA-approved for treating irritability in autism, the only two approved for such use, including in children. Other uses of psychotropic drugs “for autism” are off-label. Most, if not all, antipsychotics are less than ideal medications: they can be sedating, and can also cause serious movement disorders such as tardive dyskinesia. In discussing antipsychotics in my survey, Alex wrote: “I was really disconnected from my emotions while I was on [Risperdal] for most of my childhood. It also caused tardive dyskinesia.” They were misdiagnosed with bipolar disorder at age four. S.L. noted drastic weight loss, fainting, and appetite disturbances that were not taken seriously as a side effect of antipsychotics. A study led by Dr. Sinead Brophy and published in 2018, found that, “Antipsychotics are prescribed predominantly to those with intellectual difficulty/autism and there is evidence that they can increase rates of respiratory disease, epilepsy, diabetes for all, and of hospital-admitted depression and injury.” Even for those whom the drugs are supposedly designed, they have risks of inefficacy and provoking serious relapses. Some studies have also found there is an increased mortality risk from antipsychotics. While some people feel antipsychotics help them and choose to be on them, these drugs are prescribed to autistic people at high rates despite the risks. The anti-depressant SSRIs should also be used with caution, as they too come with a host of side effects, some of which autistic people may experience intensely. We can also experience confusing signals from our bodies—like alexithymia—and communication barriers. This is potentially dangerous if negative side effects occur. SSRIs can also be very difficult to quit. What reasoning goes into prescribing autistic people these medications? According to IAN’s report, 62% of parents thought the use of a psychotropic medication on their child came with low risk, and 80% felt their children improved on the medications. Survey respondent Cass believes the purpose of the medication given to them was control: They were considered not just autistic, but a “bad kid.” Respondents “12 year old boy” and Kem reported being prescribed drugs to shut them up and keep them still. Kem also received a misdiagnosis of bipolar disorder, as did Cat—who misdiagnosed with multiple forms of bipolar, along with borderline personality disorder. S.L. says that factors included their methods of communicating, which included “lack of verbal communication,” and age. In 2017, the FDA hosted a “Patient-focused Drug Development for Autism” public meeting. I was one of only three self-advocates on the panels. We spoke of clarifying co-occurring conditions from autism, and assessing what resources were needed there. We asserted that we didn’t want “treatments” that simply shut down our autistic traits. We wanted better communication tools, help with movement and task initiation as well as executive functioning, and supports for community living. There is a need for quality of life supports as opposed to automatically choosing medications “for autism.” It’s not just the direct effects of the drugs—there’s a diversion of funds that could be better spent on researching supports. But the direct effects of psychotropic drug cocktails on autistic people can be indelible and devastating. Survey respondent Cass’s academic career was ended by the effects of the antipsychotic Geodon. They just want to be able to write again. Kem doesn’t trust medical professionals anymore. Neither does Alex. Cat reflects, “If I had known that my differences were autism, I could have built a life and career around something more compatible with my actual needs.” They have instead experienced 15+ years of chronic and debilitating stress-related pain.